It's rare I find box mods I really like these days. I love the Ace Card etching mixed with the digital camo. With my coupon and this unit being on sale your looking at one of the lowest prices going. 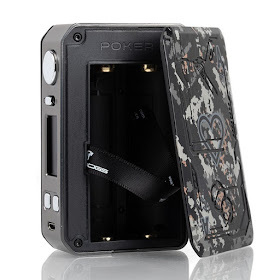 The Poker 218W Mod is an advanced vaping platform that features a lightweight chassis construction, a fully equipped user control suite, and a one-of-a-kind playing card and digital camo design. The Poker 218W features a high-grade 304 stainless steel construction. User control suite features Memory Mode, Taste Mode (Normal, Soft, Hard, User), Temperature Control Mode, and TCR.